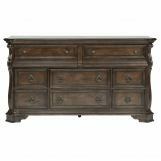 The Arbor Place Bedroom Collection by Liberty Furniture will draw attention instantly. 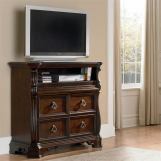 The superb group is made of Poplar Solids & Birch Veneers in Brownstone Finish. The gorgeous sleigh bed features amazing Burnished Brass Scrolled Metal Inserts that are carried over to the matching landscape mirror. 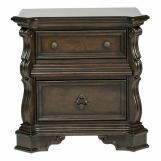 The case pieces show Canted Corner Accents, Fancy Face 4 Way Match Veneer Tops, Shaped Pilasters, Scrolled Bracket Feet, Rope Twist Mouldings, as well as Step Moulding which adds dimension. 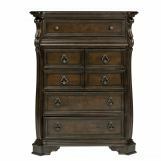 English Dovetailed Drawers are provided with Burnished Brass Drop Ring and Knob Hardware. 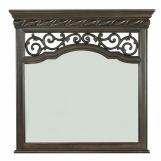 Create the ambiance you always wanted in your master bedroom with this eye-catching collection!